Machu Picchu in one or two days and time for birding. Machu Picchu must be seen even if you are on a birding trip. And there are birds that can be seen near the ruins. Even if you only have a day it is worth your time. Kolibri Expeditions provides plane tickets from Lima, train to Machu Picchu and private transport between Cusco and Ollantaytambo. You are collected at the airport and depending on time of departure to Machu Picchu (normally around 9 or 10) from Ollantaytambo, you may do a quick visit to the Cusco Main Square (Plaza de Armas) and Sacsayhuaman. In some cases with very early flights from Lima it may be possible to do a quick visit to Huacarpay for Bearded Mountaineer. The earliest flights from Lima usually arrive around 7am. The two day program gives you a little more time. At arrival in Cusco, you go to Huacarpay to bird these wetlands for Puna and Andean Teal, Andean Duck, Andean Gull, Andean Coot, Puna Ibis, Many-colored Rush-Tyrant, Wren-like Rush-bird, Yellow-winged Blackbird and many more. Nearby, in the wild Tobacco bushes one can find Bearded Mountaineer and Green-tailed Trainbearer and the scrub holds the endemic Rusty-fronted Canastero and the localized Streak-fronted Thornbird. Later you return to Cusco to see some of the town such as Plaza de Armas with the Cathedral and the fortress of Sacsayhuaman (entrance fees not included). The driver will take you to Ollantaytambo, where you can visit the Inca fortress on your own before taking the train to Machu Picchu for an overnight stay. 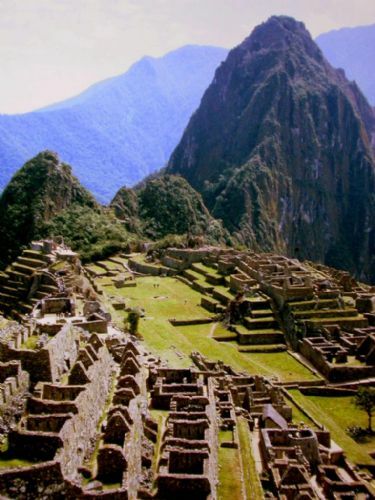 The next day you have a full day at Machu Picchu and Aguas Calientes to explore the ruins and bird watch. There is a good field guide for Machu Picchu which will help you ID the birds you see. In the afternoon you return to Ollantaytambo or Cusco. include guide to Huacarpay, transfer to Ollantaytambo, Train tickets and lodging at Aguas Calientes. Does not include meals, entrance fees, bus-ticket to Machu Picchu. include guide to Huacarpay, transfer to Ollantaytambo, Train tickets and lodging at Aguas Calientes and flight tickets return Lima-Cusco. Does not include meals, entrance fees, bus-ticket to Machu Picchu.